Army Takes Steps To Protect A Shooter's Brain From The Weapon's Blast : Shots - Health News The Army tells NPR of plans to monitor blast exposure across a military career, to enforce limits on firing certain weapons, and to even look into whether special helmets could help stop blast waves. 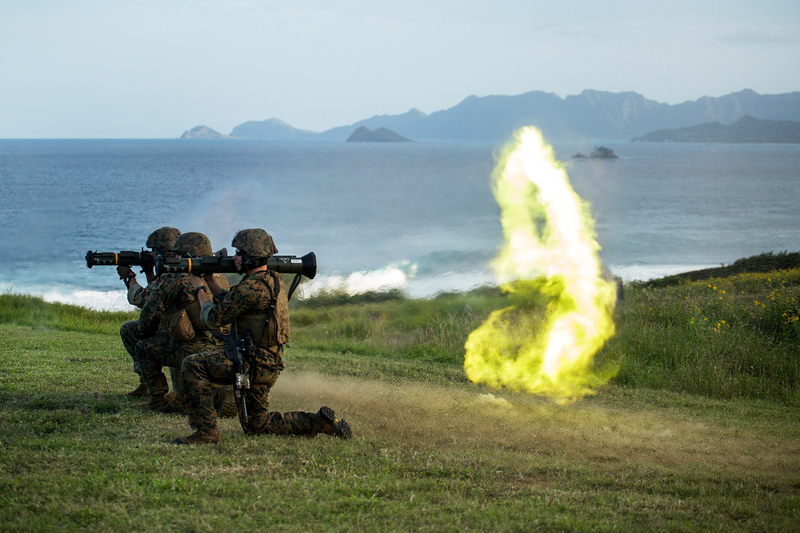 Marines based in Okinawa, Japan, fire an M136 AT-4 rocket launcher as part of a weapons training exercise on the Kaneohe Bay Range Training Facility, in 2014. Though several scientific reports over the past year have noted the possible risk, until now military officials have been reluctant to speak publicly about whether repeated exposure to these blasts might result in injury to a shooter's brain. Tracie Lattimore, who directs the Army's traumatic brain injury program, agreed to an interview with NPR to talk about steps the military is taking. "We are leaning in and trying to do everything in our power to protect soldiers and service members while they continue to get their job done," says Lattimore, who works in the Office of the Army Surgeon General. She describes a wide-ranging effort that's already begun and includes scientific research on troops' exposure to blast during weapons training, enforcing limits on the firing of certain weapons, and even looking into whether special helmets could help stop blast waves. The Army also has plans to monitor service members' total blast exposure during their military careers, Lattimore says. And even as the Army starts to take preventive measures, some basic questions still need answers. "Is blast exposure hurting service members or soldiers?" she says. "And if it is, what are those thresholds — and how can we home in on those? And then how can we modify our equipment or the way we operate to prevent injury?" Blast exposure became a big issue for the military during the wars in Iraq and Afghanistan, where roadside bombs posed a major threat to U.S. troops. The military realized that the blast from one of these bombs could cause a traumatic brain injury even if it didn't leave a scratch on a service member's body. "We were totally concerned about the enemy weapon and the impact of the enemy weapon on our soldiers," Lattimore says. Now, she says, military officials are turning their attention to the explosions from weapons fired by U.S. forces. These weapons include the AT4 and Carl Gustaf, both of which fire rounds that weigh several pounds and are powerful enough to take out a tank. The blast from firing these weapons contains as much energy as the blast from a small bomb. The risk to a person's brain comes from an invisible pressure wave generated by an explosive blast. This blast wave travels faster than the speed of sound as it passes through a person's skull. And scientists have shown that if the wave is strong enough, it can damage brain tissue. Gunners say each blast feels like a punch to the face. And studies by the military show that service members who fire these weapons a lot can experience headaches, temporary memory loss, and other symptoms like those of a concussion. There's no longer any doubt that the blast wave from a roadside bomb can inflict serious brain damage, says Dr. David Brody, a neurologist at the Uniformed Services University in Bethesda, where the military trains its health professionals and scientists. Several years ago, Brody used a special type of MRI to look at the brains of U.S. military personnel who'd been exposed to bomb blasts. Many of them had evidence of traumatic brain injury, according to a study published by his team in 2011. Today, the military recognizes the risk of brain damage from bombs, and has implemented a policy to identify troops exposed to blasts and remove them from combat until they have a chance to heal. But the risk from weapons blasts remains a mystery, Brody says. "There is no consensus," he says. "There is not a real solid understanding of what these blast exposures do, if anything." The model is football players, Brody says. Studies have shown that thousands of relatively minor head impacts during a player's career can cause the same sort of long-term brain problems associated with full-blown concussion. These include problems with memory and thinking, and an increased risk of developing dementia and a brain condition called Chronic Traumatic Encephalopathy. But the military doesn't know how many weapons blasts troops are being exposed to, Brody says. "If the service members are being exposed to thousands to tens of thousands of events, then we've got a very clear analogy to football," he says. "If they're being exposed in their lifetimes to dozens or hundreds of events, then it's not analogous at all." To find out how much blast exposure troops are getting from heavy weapons, the military is using a device known as a blast gauge. The gauges got their first wide use in Afghanistan in 2011. The Army put wearable gauges on thousands of military personnel in an effort to record the intensity of blasts from roadside bombs. Surprisingly, the gauges also indicated that fairly strong blast waves were reaching the heads of some soldiers who fired heavy weapons like the AT4 and Carl Gustaf. The Army says it eventually stopped using the gauges because it was hard to collect useful data in the chaotic environment of the battlefield. But training offers a more controlled setting to study blast exposure, Brody says. "The scientific program going forward is to get blast gauges on these service members and measure their lifetime history of blast exposures," he says. That is also the recommendation of an Army-commissioned report released in April by the Center for a New American Security. And the military is planning to use an updated version of the blast gauges in a major study of blast exposure that was ordered by Congress late last year, Lattimore says. Already, she says, military researchers are using the devices to help troops avoid excessive blast exposure during weapons training. "If our researchers are out on a range and measuring exposure to a certain weapons system and they see a reading that is higher than what we anticipated, they can pause the training," she says, to figure out what the problem is and fix it. Examples like this show how dramatically the military view of blast risk from any source has changed, Lattimore says. "We are in a different place now than we were five years ago or ten years ago," she says. Brody agrees. "In the early days, there was a little bit of resistance to even acknowledging that there might be a problem," he says. "And I do not see that now. The culture has changed so dramatically for the better, it's great to see." But Lattimore cautions that the mission of the Armed Forces hasn't changed. So even though there's a desire to be "maximally protective," she says, "the military has a job to do in terms of preparing for war and going to war, and that is an inherently risky business."